Trek10 is an Indiana based consultancy that specializes in using the latest and best services around container-based and event-driven architectures alongside the rest of the AWS services to design, build, and support new systems for their customers. They also aim for massive scalability, high up-time, heavy automation, and remarkably low operating costs, much of which they accomplish through the use of AWS Lambda and the Serverless Framework. Announced at the Tokyo Game Show in September, DEKKI, described as a cross between Medium and sites like Mobafire and HearthPwn, promises to bring together the industry’s favorite games and platforms to enable users to share strategies and opinions on the games they love. That said, conceiving of an intuitive, multi-lingual platform that is simple to use is one thing. Delivering a user experience that differentiates itself in the fast paced, ultra-competitive gaming industry is an entirely different story. PlayBrain, the company behind DEKKI, (described as a cross between Medium and sites like Mobafire and HearthPwn), partnered with Trek10 to build out a platform that enables users to share strategies and opinions on the games they love. The challenge put forward to Trek10 was simple, “Build an elegant system that is infinitely scalable… and low cost. 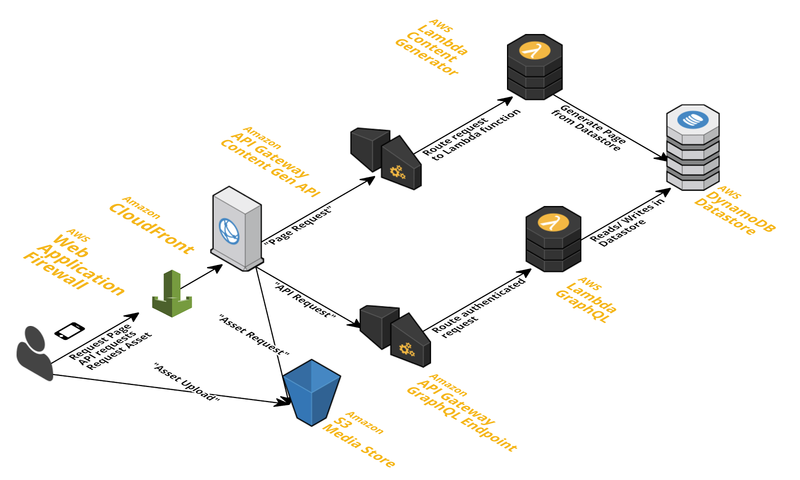 Trek10 designed and built a serverless infrastructure, using the Serverless Framework, for PlayBrain that is centered around event-driven computing with AWS Lambda. The architecture in all cases relies on the highly performant GraphQL, Lambda, API Gateway, DynamoDB (GLAD) stack and CloudFront for edge caching of static content to speed up read times of the application content. The Serverless Framework allowed Trek10 and PlayBrain to work in parallel on the frontend ReactJS based editors as well as the backend API and rendering engine. Trek10 estimates that when compared to a project leveraging typical infrastructure (EC2 / Docker based), Serverless saves roughly 40%-60% of typical infrastructure development time, allowing the Trek10 team to focus more on the core value. Check out the Trek10 Case Study for more on the specifics of their process and results. Spoiler Alert: Infrastructure costs were less than $200/month! Activate analytics and alerts quickly by automatically wrapping your Serverless functions with IOpipe.